The political program of Unión del Barrio was originally published in December of 1986. Since then it has been revised and expanded numerous times. The program is available as a free PDF download or for purchase as a physical booklet available from La Verdad Publications. Originally published December 1986. Revised February 1993; January 1995. Tentatively approved during I Congreso Nacional, January 1997. Revised and approved at Unión del Barrio Special Meeting, October 1997. 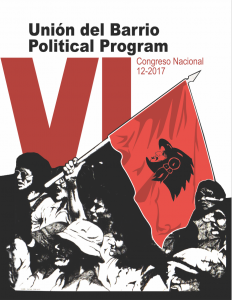 Revised during III Congreso Nacional, February 2005; IV Congreso Nacional, August 2008 to March 2009; V Congreso Nacional, December 2012-February 2013; VI Congreso Nacional, December 2017. To join or offer support for the work of UdB, click on the banner or here.